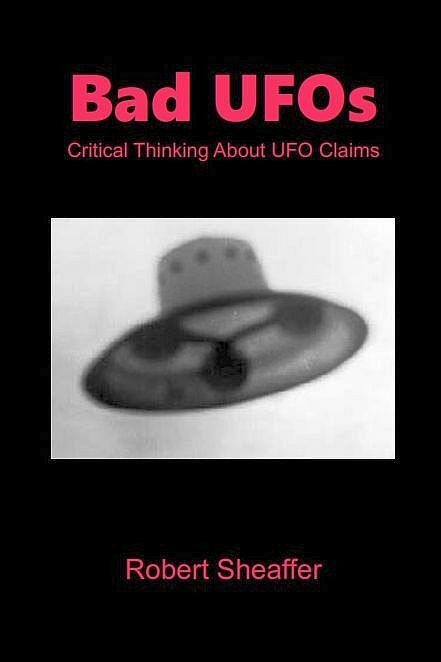 Bad UFOs: Skepticism, UFOs, and The Universe: Flying Saucer, or Fly? Is this the case UFO skeptics have been dreading? To reply to Leslie Kean's question: "Is this the case UFO skeptics have been dreading?" the answer is "no it is not." Furthermore, UFO skeptics, and probably even a great many UFO proponents, have long given up hope of any photographic or video evidence ever turning out to be the real thing. No doubt a careful analysis of the audio will reveal a cry of "help me." "Is this the case UFO skeptics have been dreading?" Hey, Leslie! Are you still beating your (dead) horse? Zoamchomsky, hmmm, a Dead Horse. No wonder there are so many flies around. I wonder if Leslie has conferred with "Roswell Rod" expert, Jose Escamilla, on the possibility--however wildly remote--that what we see in these videos may be not ET spacecraft but living earthly heretofore undiscovered interdimensional entities! Afterall, anything could be true; and if you're spinning a nutty yarn, why not go all out? Belief: The uncanny power of the human mind to ignore the blatantly obvious. 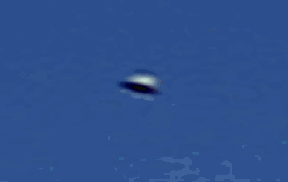 My 11 year old daughter just walked in and looked over my shoulder, saw the Chilean "UFO" close-up photo and immediately said "huh, that's just a bug". Geez, if a frickin' child can see it then how dumb can Huffpo editors be? i am a born skeptic so i'm always sharp eyes and ears when it comes to the fantastical to see if it is explained. nobody want to be proven wrong than a skeptic. my motto: go ahead. prove me wrong. a person of true intellect doesn't go into anything w/a closed mind but one wide open to suggestions, ideas that work. me wrong? i might be but then, prove me wrong. Leslie Kean has just doubled-down on the Chilean UFO video on her Facebook page: "Have patience folks. More info will be presented soon. You can't draw conclusions from looking at only one tape. And please remember, these images have been analyzed by experts in Chile. Didn't I emphasize that enough in my Huffington Post story? They too thought the footage was a bug at first, until they collected the other tapes. It is an insult for you carry on about this being a bug, when obviously if you can figure that out so easily, the Chilean experts would have done the same." Like I said, she REALLY is trusting of so-called "experts" making proclamations about UFOs. So, I guess it begs the question: expert in what? Since no one has ever demonstrated anything even remotely close to genyoouwine alien spaceships, the only practice that someone could become an expert of would be debunking. Or, silly me, am I over-thinking this again? I'm supposed to just gasp in awe at this meaningless adjective for unnamed persons, aren't I? Now, correct me if I'm wrong, here: Isn't it the UFO proponents that are always pushing for disclosure? Because they frequently seem to be vague on details themselves, promising them "in a jiffy." What, do they have to dry or something? In Bangalore, India on Oct 17-18, 1849, Lt. Herschel, grandson of Sir William Herschel, observed two days of strange objects silhouetted against the sun. They appeared as luminous dots or disks, some with appendages. He thought he saw a corona or fuzziness around them and adjusted his telescope to get a better focus. They appeared very high up. However, the 'objects' were identified later. And what did they turn out to be? Merely a swarm of locusts crossing the sun's face! Yet presumably Leslie Kean would refer to Herschel as an 'expert'. Kean doesn't seem to realize that this has the potential to become a career-defining folly, like Conan Doyle and the fairies, or Allen Hynek and "swamp gas." It's not like she said "maybe this might be authentic." She started from the premise that this video might be the game-changing, UFO-revealing case that "skeptics have been dreading." If she were smart, she would cut her losses and take the hit: "I guess I was too hasty, and too trusting. Everybody makes mistakes." If she were REALLY smart, she would do that, while placing the blame, as squarely as possible, on the CEFAA: "They said they had 7 videos, but released only one. And that one was clearly edited to show only the parts where the insect looks like a UFO. They refused to release the rest of the videos, or the full report of their so-called 'experts.' Folks, we've been had by the CEFAA, and I'm afraid that they're trying to fool us." But she is NOT that smart. Instead she did about the dumbest thing possible in the circumstances, which is to double-down on the original mistake. In essence, she said "If you folks just be patient, I'm sure that the CEFAA will release more videos, and when they do, you'll see that it's a Real UFO!" Leslie Kean is a True Believer in UFOs, and True Believers are so blinded by their strongly-held preconceptions about UFOs that they fail to perceive the obvious. If Ms. Kean had been appropriately cautious about this video, would she have garnered any attention from mainstream media? Maybe her doubling down isn't so dumb because it stirs the publicity pot some more. Care to wager whether any definitive evidence will be forthcoming? Hard to imagine they held back the REALLY good paradigm busting stuff. So we wait. If the killer video(s) comes to the fore, Ms. Kean will be hailed as a far-sighted genius. If not, she waits quietly for the swamp gas smell to dissipate and repeats the cycle by breathlessly promoting the new best-ever evidence of the day. This basic business model has worked for decades. The evidence suggests to me that she is smart enough to perceive that clearly. You may be right about that. You seem even more cynical about UFOlogy than I am! - an independent cameraman at the same event recorded similar-looking objects, but moving in opposite directions from the "official" UFO. 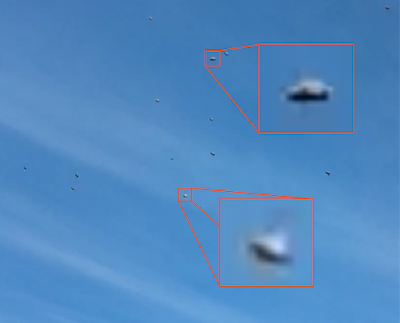 - Similar UFOs have been found on other videos of an air show at the same location, but ON A DIFFERENT DAY! So either UFOs infest the El Bosque airfield, or alse flies do. Nice article. In the case of the photograph you mention towards the end of your piece, Kean was aided by the NARCAP with a full paper proposing to analyze the photo. The "analysis" was a complete joke, full of scientific-sounding measurements (from Photoshop!) but meaning nothing at all. The author gave himself away almost immediately, referring to the flare-like artifact as a craft early in his "analysis". A good portion of the paper was spent jabbering about how the photo was taken in a sky lane since that is NARCAP's pretend reason for existing: protecting air travel from the horror of UFO attacks (or something like that). Another section dealt with other cases on different days and many miles away that the author saw as somehow related. One thing the NARCAP paper never considered naturally was that the "UFO" in the photo might have been an optical, mechanical or digital artifact especially common in photos taken towards the sun (as this one was). It also never considered a reflection from inside the vehicle. From the beginning, the author KNEW that he was looking at some gigantic spacecraft. In short, NARCAP showed itself to be a non-scientific in this paper with a worthless "analysis" designed to promote their unproven and unsupported dumb ideas. These are guys pretending to be rational and objective, without actually having those qualities. This video proves that flying saucers can morph into insects. Little green men are frequently seen on the wings of flies, beetles, wasps, and other flying insects. The New Age has six legs. Yes, they look like blurry objects in the sky. And that's where the similarity ends. Note Hoaxkiller didn't include those later objects in his video. This is the same argument by omission method that every single skeptic is practicing right now by failing to mention former JREF board member and co-founder Dayvi Pena's conviction for fraud. And the irony of a Sheaffer citing ATS for anything is too delicious. Who said anything about spacecraft from another world? Did I? This was a military base- who knows what it could have been? I think Kean was wrong to get excited about all of this. And no, the objects don't look exactly alike no matter how hard you want them to. The object from the Chile video is a simple classic saucer and the bee picture has obvious wings, legs, etc. Your desperation is made clear by your multiple logical fallacies, as is so often the case. The old guard like Sheaffer have done a terrible job at training the new generation. Add the zero population growth type birth rates of the skeptic/atheist class, and the future doesn't look good for "reason." "The Secret Sun" huh, Chris? Oh, Please! Do you know the first thing about astronomy? Its a bug dude - just leave it. I bet if they dumped a pile of manure right in front of the camera there would be a lot of these "UFOs" on the video. Well Kean is going to stand with "this is what the experts told me" line. Apparently, she blindly trusts whatever they say no matter how the evidence starts piling up against them. So much for investigative journalism. Speaking of which, Billy Cox is sounding off about this as well. His latest article takes Radford to task because he stated that Kean called the UFOs in her article, "a metallic interplanetary spacecraft". Cox states Kean never said this. Well, Kean did use the following descriptions of the UFO - "dome-shaped", "no visible means of propulsion", "appears metallic", "emits some form of energy", "extraordinary machine", not "man-made", "Humans could not survive these speeds", and "clearly under intelligent control". She sure did not use those words but she practically stated that it was "a metallic interplanetary spacecraft". UFOlogy rule #1. Don't say "This proves the ETH" because you really don't have the evidence. Just say "it is an unknown craft that defies the laws of physics piloted under intelligent control" (or words to that effect). Then you can pretend that you did not say it is an interstellar spaceship. Exactly, Tim. As our old Astronomy-board mates would do: Use "UFO" as if it meant "ET spacecraft" while serving up the entire catalog of cases as evidence of a "UFO" reality and confirmation of their belief in ET visitation. But once the case under consideration was debunked yet again, or when directly challenged on the semantics, "What's a 'UFO'?" They would retreat quickly into the neutral territory of the "Unidentified..."
Keane doesn't have to be right to profit from all of the publicity around this event. It should be worth at least a year's worth of free trips to UFO conventions. She may be able to get speaking fees as high as that other UFO "expert" Stan Friedman. I love the skeptics talking about all the money to be made in UFOlogy. Ever see how much Randi makes? How much he charges for his Meetings? Ever wonder if a single prominent skeptic will ask the obvious question "what did Randi know and when did he know it" when it comes to the fraud his partner and JREF board member Dayvi Pena was recently convicted for? As a further tactic, Kean's friends at NARCAP call UFOs, UAPs! But their papers give them away immediately. They really mean Flying Saucers. "There is an effect at work which I term the UFO Uncertainty Principle which states that one cannot have a UFO sighting which is both highly reliable and highly specific. By a reliable sighting I mean one with many independent witnesses who all agree on what they have seen. When these occur the object is usually something unspecific like a light in the sky and quickly becomes identified as a natural or man-made object. By specific sightings, I mean ones that speak of silvery craft, alien occupants and even abductions – but these are supported by only limited testimony and are highly unreliable. After more than half a century of world-wide investigation by those who have dedicated themselves to proving the reality of UFOs, there are still no Identified Alien Spaceships." I note the Illinois UFO incident back in 2000. This was both a "highly reliable" and "highly specific" incident. 5 different police officers from 5 different municipalities around the county in a recorded verified time-line saw this "thing". Now it has to be a conspiracy, right? They must have had numbers to call each other and phoned it right up the line of sightings to construct a hoax, right? Perhaps they did it for the money. No doubt they were paid generously for all the testimony and exposure they received for the interviews that ensued. Maybe they all saw the planet Venus roughly minutes apart slowly rising into the night sky. Phillip Klass got debunked for trying to debunk that one (God rest his soul). It could have been a black-ops craft recently produced by the portion of our secret military gone horribly out of control. You know how they like to scare the crap out of ordinary citizens at 4am. The fact remains that there is no real evidence. Eyewitness reports from ANYONE does not amount to a hill of beans. It is always the burden of the claimant to prove with solid evidence that ANYTHING is proof or not. But, because you may take the task of debunking, such as a simple bug, with photographic material in toe, it is an easy job. I wish we could have gotten much more material to work with. Instead of a scratchy polaroid. Or testimony of police officers in conspiracy. Or black-ops flying around Scott AFB for the hell of it. I wish we could debunk this one. Any takers? 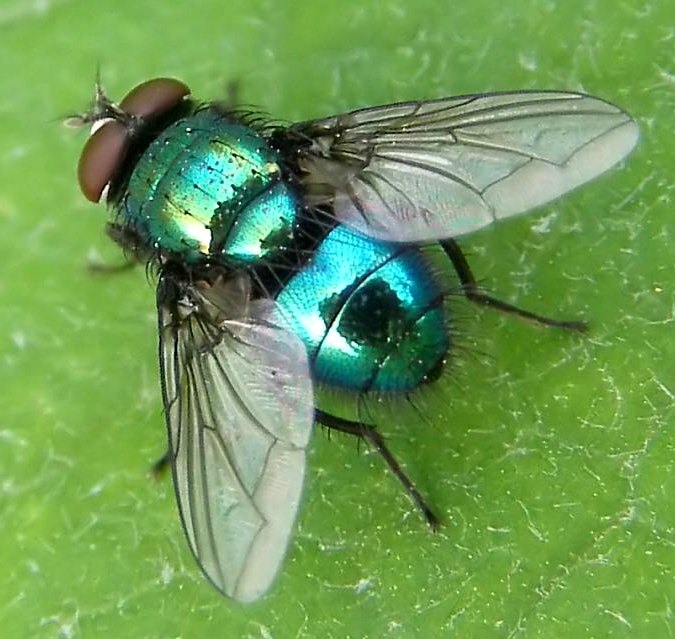 Thanks for posting the photo of the Green Bottle Fly, Robert. Such a beautiful creature. I think the photographer needs to clean his or her sensor. Voladores No Identificados (Cridovni) and the Chilean Civilian Aviation Department's Centro de Estudios de Fenomenos Aereos Anomalos (CEFAA), have "have decided to establish a cooperation agreement to work together to both investigate new cases, to evaluate new and old cases and to promote Ufology in general among the scientific community of all South America." I appreciate the fact that you have endeavored to prove that 99.99 percent of almost all of UFO experiences, whether due to sightings, indelible markings, abductions, etc, are completely false. I can't understand why you cannot respond, along with anyone else on your blog, to this simple request for a possible explanation of the Illinois incident. You have sold me on all of the nonsense. You have much more knowledge than me on this subject. I have critically looked at the information that has been provided and I certainly cannot come up with any reasonable idea as to why all of these people lied. Isn't that the only given? I cite again, there is no evidence. Is that enough to explain? If you refute any of this, than that is fine, but at least give me the common decency to respond. Thank you for all of your help. Obviously this bloooog has gone appreciated nay. What are you afraid of? The truth you can not find? What happens when skeptics respond to specific cases is that UFO believers simply point to another case and say "Yeah but what about this one?" For instance, Tim Printy took one of the most "respected" cases, the RB-47 case, and through a year long effort showed that a prosaic explanation fit the data. After he released his monumental report, the UFO believers shrugged their shoulders and said nothing in refutation. Robert here has DEMOLISHED many supposedly airtight UFO cases and yet there is always someone like you saying, "but look at my case!". The problem is that there are far more credulous and undiscerning UFO faithful that there are skeptics. There just aren;t enough hours in the day to show all of you how to use reason. The reasoning that you are looking for from me has already been explained: There is no evidence. I want to know why all of these people lied. I want a critical examination by skeptics to tell me, whether I deserve this, what happened that night. I understand reasoning. I am probably more of a skeptic than you are. I'm not asking for the Holy Grail. You are obviously professionals in whom I am counting on for a simple explanation. I could care less about bugs and cameras. Please don't question my reasoning when I've done that with the first post. I've reasoned that the people involved could all be lying for media/monetary purposes. I've reasoned that Klass was wrong about Venus because it could not account for the sightings according to detailed information supplied by astronomical calculations for that date to the minute and the hour. I've also reasoned that the lack of anyone to give a professional response to this "simple" incident gives me a lack of confidence in a part to explain anything other then what you want to. "Robert here has DEMOLISHED many supposedly airtight UFO cases and yet there is always someone like you saying, "but look at my case!". Hats off to Robert, but this isn't my case. This is everyone's case. You are included. I would wish a credible response. That is my reason. ing. Kean said on her Facebook page that her new article on the Chilean UFOs will be in the Huffington Post Monday. What will it say? Maybe we ought to have an "office pool" bet: What will Kean do with the fly? She also mentions that there is a new compelling case that she is including. My guess is it will be a combination of B and C. She is going to, once again, reassure everybody that these experts are sure they are not bugs. However, she will provide no data, no reports, or any real analysis. It will probably include some new frame grabs with photoshop filters applied to make it appear something "scientific" was performed.She will then spend over half the article presenting this new case as a diversion (The bait and switch). This is the standard style of writing she has employed in all her articles and her book. She does not question UFO proponents/sources but she does question skeptics conclusions or reasons for rejecting the information. She is suffering from a "will to believe" and not performing actual investigative journalism. Leslie Kean is now three days late with a promised update of her Fly Saucer story. On her Facebook page she said last week that she would have a new Huffington Post story about it by Monday. Since then she has written, "This story is still transforming itself as I learn more...needs more time." I wonder what that means? I guess it will be some time before she gets her "ducks in a row". It is now the 13th (four days after the promised delivery of the rebuttal) and Kean seems to have removed the comment about her writing the article from her Facebook page. Things that make you go hmmmm....Tick, Tock, Leslie...Tick, Tock..... I guess she figures if she ignores it, it will go away. Not only is Kean five days late on her promised update of the Fly Saucer story, but she seems to have removed all mention of the update from her Facebook page. Maybe she has finally realized that the video REALLY DOES show flies buzzing around, and she wishes that people would just forget the whole thing! It is now Wednesday (two days past when she originally promised the article) and no article. Her facebook comment says that the case is developing as she learns more....Excuse me but I thought you were supposed to learn about the case BEFORE you write the original article. So, either she is finding out more about the bug videos or this new case, which she will be hyping more than the bug videos. I am leaning more and more towards a "bait and switch" article. I bet she even barely mentions the bug video now hoping that nobody will notice. Hmmm... I have become beheaded by Google! Hopefully I fixed it. The longer she delays and deletes postings by her on Facebook, the more it appears that is going to chicken out on this. The article, if it appears, will be a rehash of reassurances that they aren’t bugs because CEFAA says so. She will then promote this other CEFAA case she is muttering about. She probably has nothing more and CEFAA is just giving her information about some new case. Almost a month ago (between the 16-19th), she was promising her readers on facebook that more information will be released soon (implying reports and more videos). I think CEFAA has a lot of egg on their face and they don’t want to reveal the information. The same can be said for Maccabee and Haines, who suddenly have been ultraquiet about their involvement. My guess is they concluded they could not figure it out and it must remain unidentified. The lack of any reports whatsoever indicates to me that there is a desire to sweep it all under the rug. A reverse cosmic watergate! Can you show the calculation that accurately determined the 6000 mph value or are you just blindly accepting the story being told? I saw a similar thing a month ago in Granada, Spain, in Sierra Nevada mountains. What puzzled me was this thing, apparently metallic up there, one moment I saw it and then as if someone switched it off. It was a clear sunny day, no clouds, nowhere to hide... the shape was exactly the same. Call me delusional, I may as well be. But I have a perfect eyesight and can tell a plane from a star. She' s made the biggest stuff up of her UAP career, this doesn't mean everything she claims is outright wrong. I'm probably termed a curious fence sitter, not the best place to be as you get hit by both sides. A few UFO happenings over the last 50 years still keep me wondering, Kean is the closest real investigator to the subject that has appeared recently, let's not banish her completely. Well, I'm hamstrung from responding appropriately when the disclaimer commands: "state your arguments using logic, and with a civil tone" after an article of supposed lofty intellectualism relies on expressions like: "absurd", "stupid", and "give Leslie Kean a can of Raid"; but I'll concur with the conclusion: Bugs. Can someone explain, however, why any object covering that much distance between frames was photographed as distinct dots instead of streaks? Close small objects or large distant ones, I'd expect a fast-moving object to photograph as streaks. What am I missing?